Addressing odor problems is a pressing concern in the WWT industry. One of those problems that has to be “fixed and fixed NOW!” Sometimes the first answer is installing a carbon, chemical, or biological scrubber. An alternative approach to the same problem is the addition of THIOGUARD®, which will offer superior odor reduction results, while at the same time delivering the most crucial cost saving benefit of all – system-wide corrosion prevention. 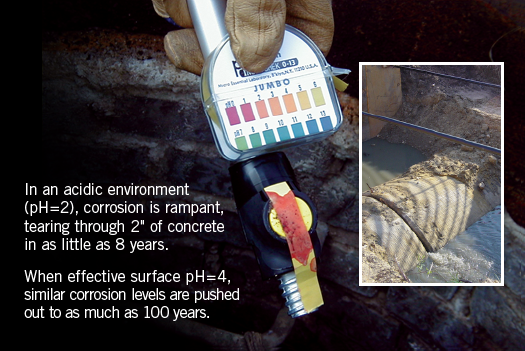 Infrastructure Corrosion is undoubtedly the most significant problem facing today’s plant operators and engineers. The EPA puts the funds required for infrastructure repair and replacement at $271 Billion. So, when you are faced with an odor problem, and you are considering adding a scrubber to your lines, you may want to ask yourself this question – Will adding an expensive scrubber help prevent corrosion and maintain and extend the engineered life of my infrastructure? Carbon, chemical, or biological scrubbers are not designed to prevent corrosion. 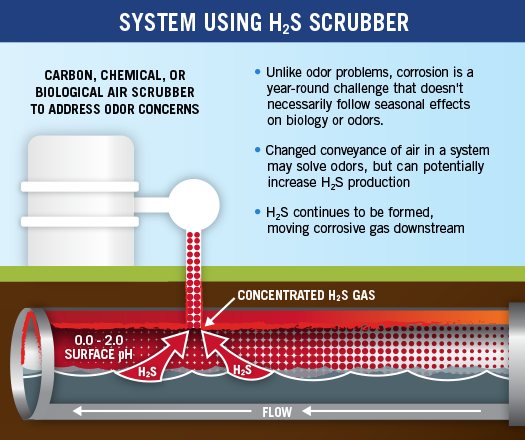 Scrubbers, by design, draw air through your lines, potentially pulling more H2S out of solution, and contributing to corrosion – specifically in crown and manhole infrastructure. 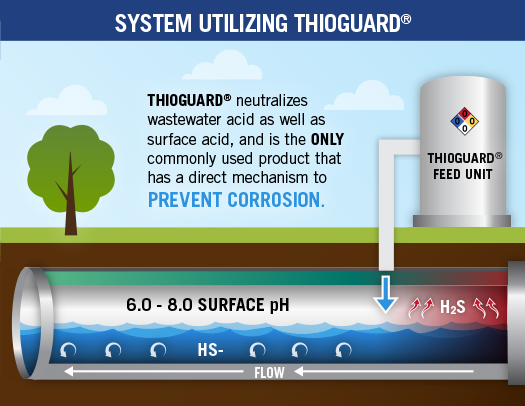 THIOGUARD® added to your system, generally through a single feed unit, suppresses H2S system-wide, eliminating your odor problem, in many cases reducing total gases released from the wastewater stream. The benefits to your infrastructure and your plant are immediate and lasting. Through a single application point, you are effectively maintaining and extending the engineered life of your existing infrastructure. 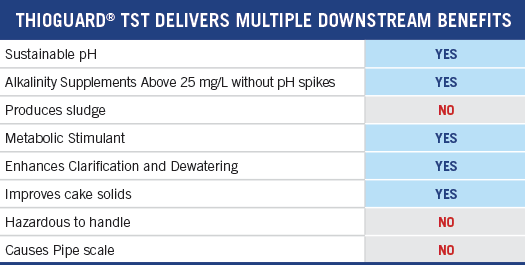 Other downstream benefits include a reduction in the production of sludge, and enhanced clarification and dewatering. 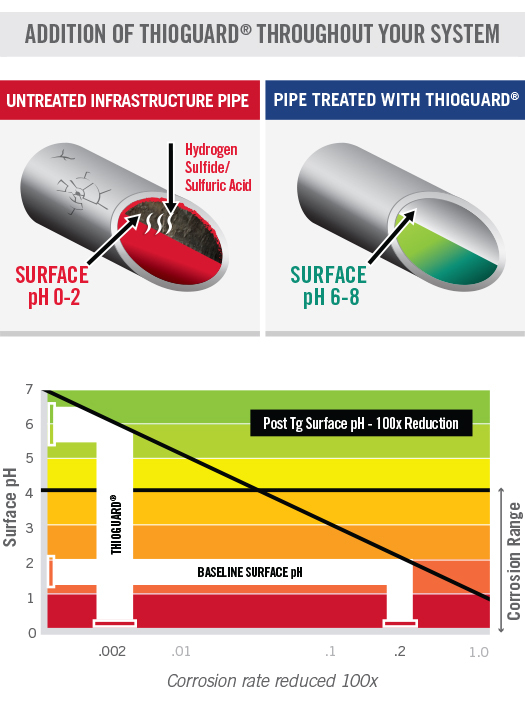 Where scrubbers are currently in use, THIOGUARD® , added upstream, will greatly reduce the overall load, thereby reducing operating costs and increasing the lifespan of existing equipment and structures. 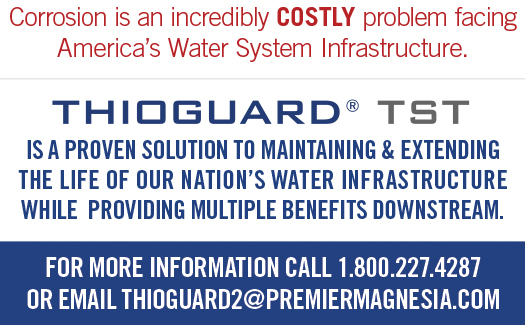 THIOGUARD® is a proven solution to maintaining & extending the life of our nation’s water Infrastructure while providing multiple benefits downstream. Many areas of the United States still use ferric or ferrous chloride for H2S control. Whether you are using ferric or ferrous, choride or sulfate, the usual discussion of sulfide removal emphasizes only the iron chemistry and glosses over other reaction products resulting from the chloride and sulfate that is released, when the iron combines with sulfur to form iron sulfide, a black precipitate. 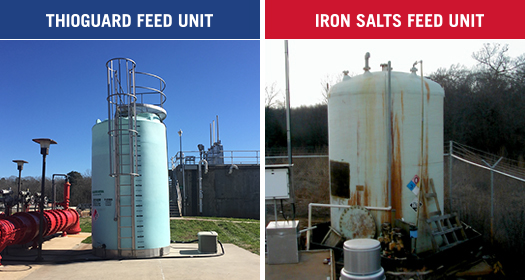 What happens when iron sulfate is used for odor control in wastewater? The first step in the reaction produces iron sulfide as a precipitate and sulfuric acid. 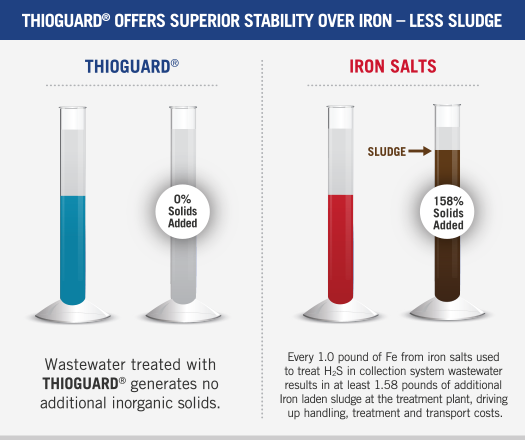 The use of ferrous choride is just as problematic, producing hydrochloric acid and creating significant challenges downstream for water re-use. f this were all that happens in wastewater, iron would be fed at a stoichiometric rate of 4.5 lbs. of ferrous sulfate to remove 1 pound of H2S. However, in real world applications, 2 to 3 times that amount is necessary for sulfide reduction, because there are competing reactions in wastewater that will consume iron. Phosphorus, chlorides, sulfates, hydroxide, carbonate, oxygen and other common compounds compete for the iron – especially in wastewaters high in saltwater infiltration. The next question to ask is this… what is likely to happen to the H2SO4 that is produced as a reaction product. 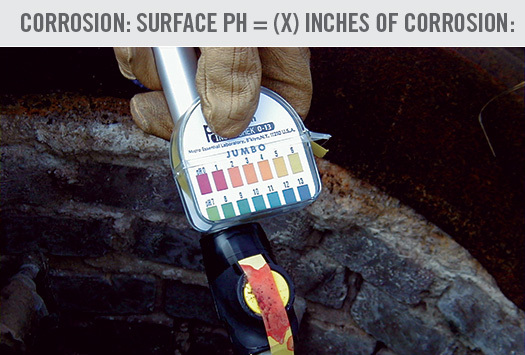 First, it is highly corrosive and works to lower the pH in the wastewater attacking both concrete or iron infrastructure. Second, sulfuric acid rapidly dissociates and will allow SO4 to be used as an oxygen source by the same Sulfate Reducing Bacteria (SRB) that produced the problematic H2S in the first place, ultimately producing even more H2S. In practice, iron sulfate could produce as much sulfide as it removes stoichiometricly, which then must be removed with additional iron. 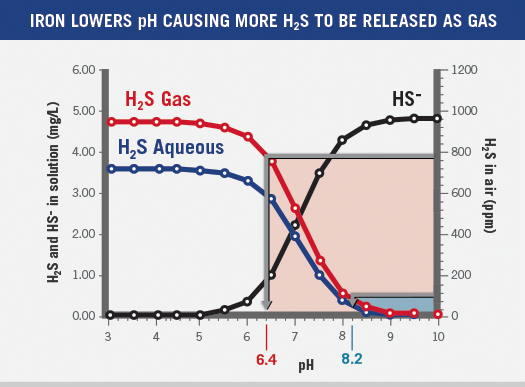 Furthermore, the lowered wastewater pH will cause more H2S to be released as gas, in accordance with both the Law of Equilibrium acid-base chemistry and Henry’s Law of partial pressure. 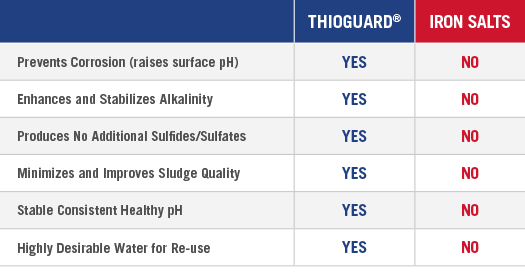 In contrast THIOGUARD® technical grade magnesium hydroxide does not lower the pH of the wastewater, produces no reaction products that can lead to additional sulfide production, and produces no sludge to settle out in the system or to be dewatered at the WWTP. 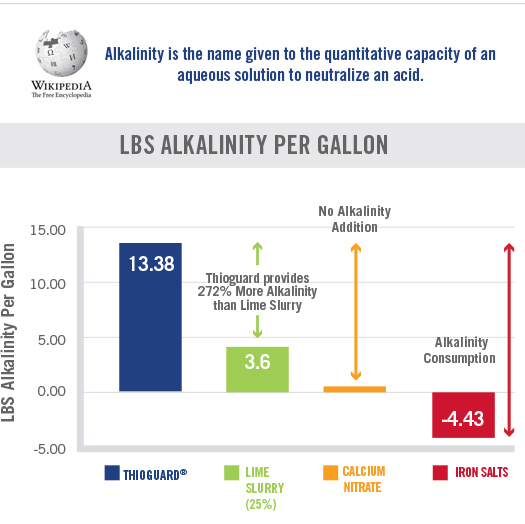 The Magnesium binds the sulfide in a similar manner to iron and it will not be released unless the pH drops to 5.5, which does not occur under normal wastewater conditions. 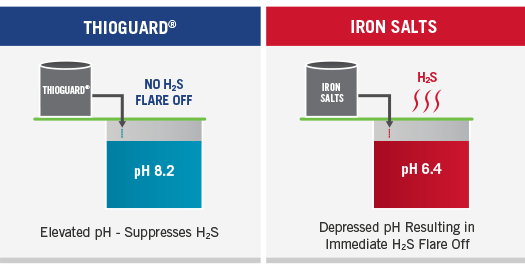 More importantly, THIOGUARD® is preventative and controls the formation of sulfide by maintaining, or possibly increasing pH and retarding Sulfate Reducing Bacteria activity. START ADDING the Solution – THIOGUARD®. 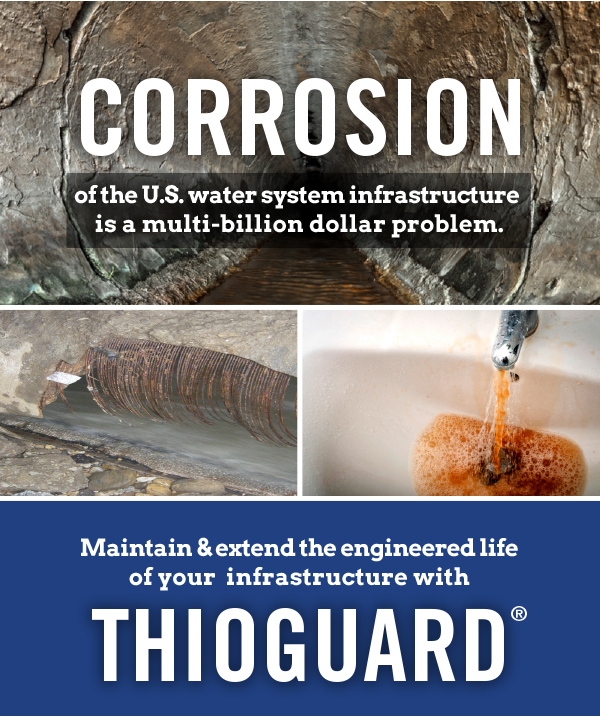 Thioguard is the ONLY commonly used product that has a direct mechanism to PREVENT CORROSION. The benefits of adding Thioguard® to your treatment processes are not limited to the prevention or reduction of corrosion. You will also benefit from a reduction in the formation of sludge – significantly reducing your handling and transportation costs. 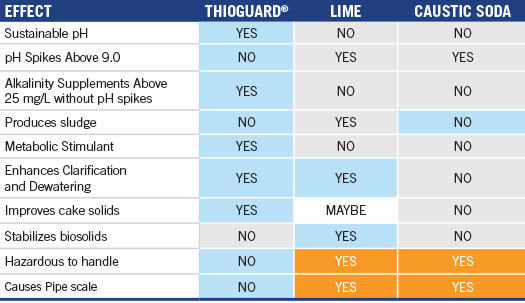 The benefits are numerous and system-wide, making Thioguard® the Practical Choice for your system.